June is always a busy Call Center Trade Show / Conference month. Whether it is a user group event or an across the industry conference June is the month for call center networking. This year something that Spectrum noticed was the number of questions that were asked about which is better for the contact center: Should I have LCD Screens showing the group level content or agent specific details on the agents desktop? Which of these options will improve our agent performance? We have low cubicle walls so we can see the screens so will that be better than desktops? We have customers, vendors and partners coming through our call center so we have to be careful about what we can display, but our supervisors are always walking around helping the agents and need to be aware of something critical happening. Should we use both or neither one? Senior management is cutting budgets so which option is cheaper? Work at home agents can’t see the LCD screens so how do we keep them in the loop? These are very similar questions that we are asked during a conference call or webinar. This write up is meant to explain what Spectrum has been told by customers about the direction that they have gone and the results they have had with their reporting decisions. Many agents are working the applications needed to do their jobs. They are not looking at the phone, they have high cubicle walls and the business applications they use keep them busy and constantly looking at their computer monitors. 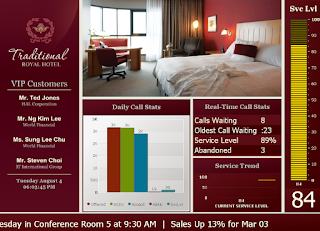 Having a desktop wallboard helps these agents be aware of key things throughout the day. They are made aware of incoming calls, the longest wait time, what the service level has been for the day, what is the current status of other agents, if they are in the customer service group they are aware of tickets that are logged and waiting. There are many things that can be included in the agent desktop reporting. The reporting depends on the call center business and trying to improve agent productivity and customer satisfaction. These advantages to the desktop reporting are well known and are used for making the decision to use desktop reporting over LCD screens. One of the disadvantageous is real estate and the need to see other information. Being able to click on tabs that show other information or having the desktop wallboard cycle through data is extremely helpful. Agents all need to know the status of other agents in their group. If they are not aware of the status of others there can be a scheduling conflict or adherence issues. Because real estate is vitally important to the agent there is no enough room to show critical KPI’s along with current status of other agents. An LCD screen can rotate through multiple screens and display the status of other agents and help keep schedule adherence at the targeted goals. There are other issues to consider when looking at agent desktops: Real estate, agent specific critical KPI’s and messaging the agents. Review the Desktop Best Practices for Agent Desktops to learn more about the benefits of using agent desktop reporting. Based strictly on customer reactions those customers that have opted to go for the agent desktops instead of LCD screens they are very pleased with their decision. These customers claim that agents are more productive, schedule adherence goals are met more often than not, customer satisfactions are improved and agents rarely complain about the desktop wallboards interfering with their jobs or desktop real estate. However, these customers did not purchase the LCD screens or software applications so are biased about their decisions. Contact centers can be physically very large and accommodate hundreds of agents. Multiple groups working in the same area seemingly doing the same tasks, but in reality managing many different daily functions. Agents need support from supervisors and managers who will go to the agents to provide assistance. And in some call centers there is walk through from vendors, customers, partners and senior management. So LCD screens are used to help the call center with appropriate real time data that everyone can use. The LCD screens display not only real time data but also content for the audience in the call center. Current critical KPI’s as well as agent log-in status is displayed helping agents meet schedule adherence goals. This content is followed by product and services information, company notices, up-coming events business and local, photos, daily images, welcome messages and just about anything else that is appropriate for the walk through audience. If the call center is open with low cubicle walls and agents want data shared then the LCD screens meet the needs for the contact center. TCO can be less than the agent desktops because of the number of agents that can see the data on the screens. If the content is not confidential and it improves the satisfaction of those in the call center or walking through then having the LCD screens in place is a wise decision. Customers have told us how much the LCD screens help the call center improve productivity, increase customer satisfaction and get tremendous positive feedback from visitors. So is there a clear winner between the LCD screens and Agent Desktops for the call center? No there is not. In fact, Spectrum has many customers that have opted to go for LCD screens only to come back later and ask for agent desktop wallboards as well. And the opposite has occurred too when the call center starts out with agent desktops and adds LCD screens. What will be the agents overall reaction to the desktops and / or LCD screens and the content being provided? 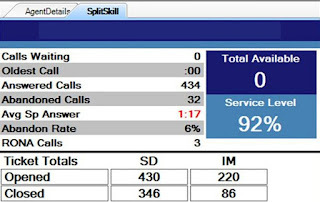 One suggestion that Spectrum provides to all potential customers who want to know the results and outcome of adding desktops and LCD screens to their contact center is to network with other call center managers. Share information and questions and you will be very surprised by what you can learn.